Here is THE book for those enthusiasts who want to take intelligent, loving care of their pets -- whether that pet be a dog, cat, bird, fish, or some exotic species. 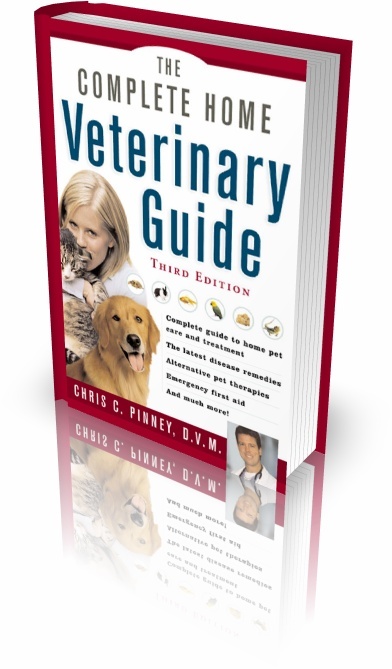 This illustrated, A-Z quick-answer guide from popular veterinarian Chris Pinney covers it all: preventive health care, diet, grooming, training, diseases, traveling with pets, selection, first aid, anatomy, holistic pet care, and much more. The new Third Edition has been updated to include a new directory of the most common drugs used in pet care; a glossary of veterinary terminology; the latest information on the pet vaccination controversy; advice for reducing stress and improving mental health in pets; the newest diagnostic and treatment methods for diabetes, arthritis, epilepsy, and other diseases; tips on caring for injured and orphaned wildlife; and a dollar-saving listing of Ten Steps For Reducing the Cost of Owning a Pet. If you love your pet and want to be a truly informed pet owner -- this guide is just what the veterinarian ordered! 846 pages back to back full of invaluable veterinary information and photographs. All fully searchable and indexed. I currently have a family of 1 Golden Retriever, 3 cats, 8 gerbils, and 1 mouse. I recommend this book to people like me who live with more than one kind of animal. It is a very good general guide and interesting reading. However, this book should in no way replace the care of a vet. This book offers a broad explaination of many topics and provides basic details and care instructions on many diseases and injuries. If you are looking for a very detailed book on one kind of animal only then this book is not for you. I am not sure I recommend this book as a primary source of information for people who care for small animals or exotic pets. I can only really say this about the chapter on hamsters and gerbils because I don't know as much about other kinds of small naimals, but I rescue gerbils and know that many important details are missing in that chapter. Gerbils and hamsters have very different needs and habbits and should not be lumped together because facts true about gerbils can be false about hamsters and vice versa. As I have already stated, THIS BOOK SHOULD IN NO WAY REPLACE YOUR VET. Neither should any other for that matter. If that is the reason you are buying this book, then I hate to say it and I'm sorry, but your animal would be better off with someone else. The symptoms of many diseases or impairments are often the same and animals are very good at masking pain because their survival instinct tells them that the weaker animals become the dead animals. Animals in pain can be very dangerous and often change their regular habbits for no reason. Your vet can provide medicines, run tests, do surgery, supply special diets and has had years of schooling, not minutes or hours of reading. Despite the last two paragraphs, I do still think this is a very good book if used properly. If your animal is sick, consult your vet and then read about the diagnosis in the book. This may not sound useful, but believe me when I say that sometimes it is; I have been through it enough times. There are also many chapters on other things besides disease and these are very interesting and useful to know. Understanding your animal will ensure it lives a happy and healthy life. I think the most valuable thing about this book are the chapters about emergency first aid for your dog or cat. That is valuable information that every good animal care book should have. In summary, it is a good book, but should not replace your vet. I recommend it only if you have a multi-species household. Because it covers so many topics, there are not as many details as one may want on any specific subject. This book has a lot of information about cats and dogs, but I know it is lacking in information when it comes to hamsters and gerbils, so it may also be lacking information on other small animal and exotic breeds as well. This book covers many other interesting things besides disease and injury and most importantly, it has a chapter on emergency first aid for your dog or cat. Click the button below to add the The Complete Home Veterinary Guide to your wish list.